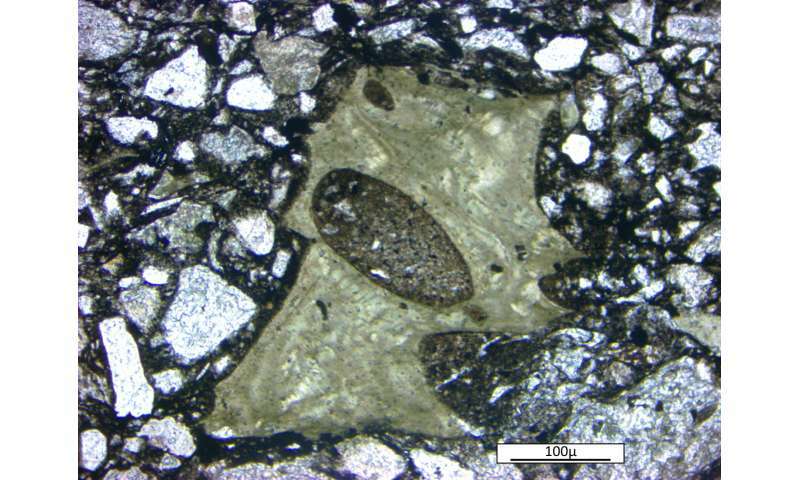 A photomicrograph of a vesicular green shard from the Onaping Formation of the Sudbury impact basin. Credit: Paul Guyett, Trinity College Dublin. Meteorite impacts can produce more than craters on the Earth – they can also spark volcanic activity that shapes its surface and climate by bringing up material from depth. That is the headline finding of an international team, led by geochemists from Trinity College Dublin, who discovered that large impacts can be followed by intense, long-lived, and explosive volcanic eruptions. The team studied rocks filling one of the largest preserved impact structures on the planet, located in Sudbury (Ontario, Canada). The ‘bolide’ hit the Earth here 1.85 billion years ago and excavated a deep basin, which was filled with melted target rocks and, later, with jumbled mixed rocks full of tiny volcanic fragments. Not only are there volcanic fragments throughout the sequence of the 1.5 km-thick basin but they have a very distinctive angular shape, which the scientists explain resembles a ‘crab claw’. Such shapes form when gas bubbles expand in molten rock that then catastrophically explodes—a feature of violent eruptions involving water, and which can be seen under glaciers in Iceland, for example. In the crater, these took place for a long period of time after the impact, when the basin was flooded with sea water. The key finding of the research, just published in the Journal of Geophysical Research: Planets, is that the composition of the volcanic fragments changed with time. Right after the impact, volcanism is directly related to melting of the Earth’s crust. However, with time, volcanism seems to have been fed by magma coming from deeper levels within the Earth. On the early Earth there was a relatively brief period during which ca. 150 very large impacts occurred, whereas since then, only a handful have hit the Earth. The findings raise interest in topical research on similar volcanism on other planetary bodies like Mercury, Venus, Mars and the Moon. There, unlike on the Earth, the lack of plate tectonics and erosion help preserve surface features, which are probed by space craft. The insight from Sudbury is complemental, the geologists say, because you can directly observe the rocks with your own eyes and collect loads of samples for detailed study in the lab.